The Ted Rogers Centre for Heart Research is dedicated to supporting aspiring investigators and future scientists. Within each program of the Centre, students and fellows not only receive hands-on experience in a multitude of research projects, but fill an important role in driving our mission. The Centre is also committed to funding novel ideas from emerging researchers. In place is an Education Fund that supports advanced projects that relate to heart failure and which demonstrate collaborations between the three partners: SickKids, University Health Network and the University of Toronto. 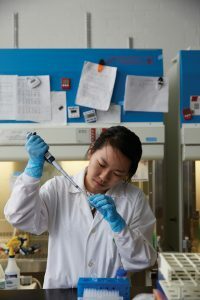 This annual fund is intended to drive novel discovery as well as the careers and bright ideas of young investigators. Its aim is to attract the world’s brightest trainees and clinical and research fellows to foster a deep pool of talent and leadership for cardiac care and research. Education Fund awards provide competitive studentships in basic and applied sciences, engineering and clinical health sciences, to support trainees at the undergraduate, graduate and post-graduate levels. Stories about Education Fund research will appear regularly on this site. Here is one such example. 2016: Congratulations to our Education Fund 2016 award recipients! For project abstracts, please click here. 2015: In 2015, the Centre held its first Education Fund competition. Click here for project abstracts. The Ted Rogers Centre hosts Canada's largest meeting devoted to heart failure. Our next event is May 3-4, 2019. For current career opportunities, click here.